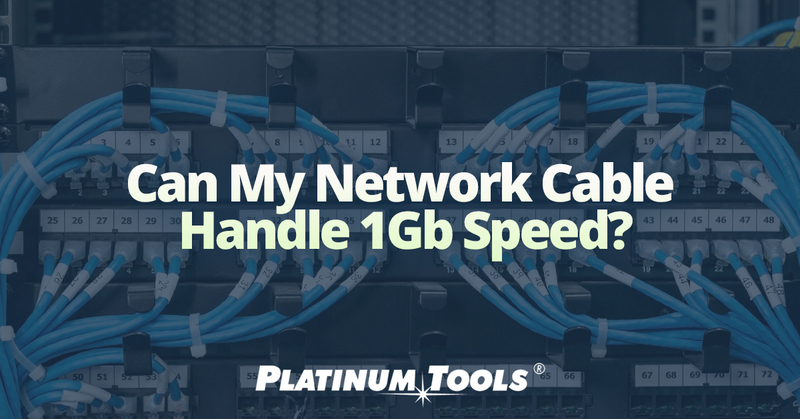 Audio Video› Can My Network Cable Handle 1Gb Speed? The increased use of cloud computing and cloud storage has demonstrated the inadequacies of many internet connections. Even within large organizations, LAN bandwidth is often nowhere near the theoretical capability of the connection. So how do you find out if your network cable can handle 1 Gbps speed? It’s important to clarify what 1 Gb speed really means. 1 Gb speed is the transmission of 1 gigabit of information per second. The correct terminology is 1 Gbps or 1,000 Mbps. Mbps stands for megabits per second and should not be confused with megabytes per second (MB/s). Confusion exists because the earliest computers were only capable of transmitting 8 bits at a time, the transmission was called 1 byte, thus 1 byte represents 8 bits. An 8 core cable with 4 twisted pairs is required to transmit 1 Gbps. Two pairs are used to transmit the signal and two to receive. The cables are fitted with RJ45 connectors. The pairs must be connected in accordance with either the T568A or T568B standard, although most installations use T568B. In order to reduce the amount of crosstalk between adjacent pairs, each pair has a different number of twists per inch. Apart from that, it’s essential to use good quality cable that complies with industry standards. Although not originally intended for 1Gb Ethernet, Cat 5 cable does usually perform well enough for 1 Gbps operation. Also note that some Cat 5 cables have only 4 wires (2 pairs). A better to use Cat 5e cable, which is specifically designed for high-speed Ethernet, or Cat 6 cable. Careful attention must be paid to ensure there are no split pairs, that all connections are to specification, and that the cable is not kinked. It’s also essential that the length of each patch cable doesn’t exceed 100 meters (328 feet). A network will only be as fast as the slowest link in the circuit, so it’s necessary to verify the network capability of each item. Older equipment, rated for 100 Mbps operation will not be suitable for 1 Gbps. Some types of equipment require the use of special gigabit ports. In other situations you need to ensure the equipment is configured for 1 Gbps operation. It should be noted that most switches and routers will automatically downgrade the connection speed if the equipment detects any incompatibility. Therefore, it is important to verify the actual link speed. Prior to installing a 1 Gb LAN network, check each component to make sure its 1 Gb compatible. Visually undetectable issue could downgrade the network. For this reason, technicians working on 1 Gb Internet and Ethernet circuits should always use a suitable digital network tester. Every technician working on 1Gb internet, ethernet circuits need a suitable digital network tester. The Net Chaser™ is the solution to the 1 Gb testing issues. The Net Chaser™ has the ability to verify the length of each network cable and identify cable faults and limitations that interfere with network capabilities including split pairs, shorts and open circuits. Additional features include network pinging, DHCP, VLAN, link light identification to verify to which ports cables are connected, and the measurement of PoE and more. The Net Chaser™ can also measure the Signal-to-Noise Ratio, Delay Skew as well as a 1 Gbps Bit-Error-Rate Test to help identify reasons for poor network capability.